Our optical transmitters allow the generation of optical signals of up to 264 Gbps. In addition to the well-known ASK format (also known as OOK), we also produce instruments for the generation of PAM, DPSK, DQPSK, DP-QPSK and QAM signals. The wide variety of optical transmitter products are well matched on the receive side. 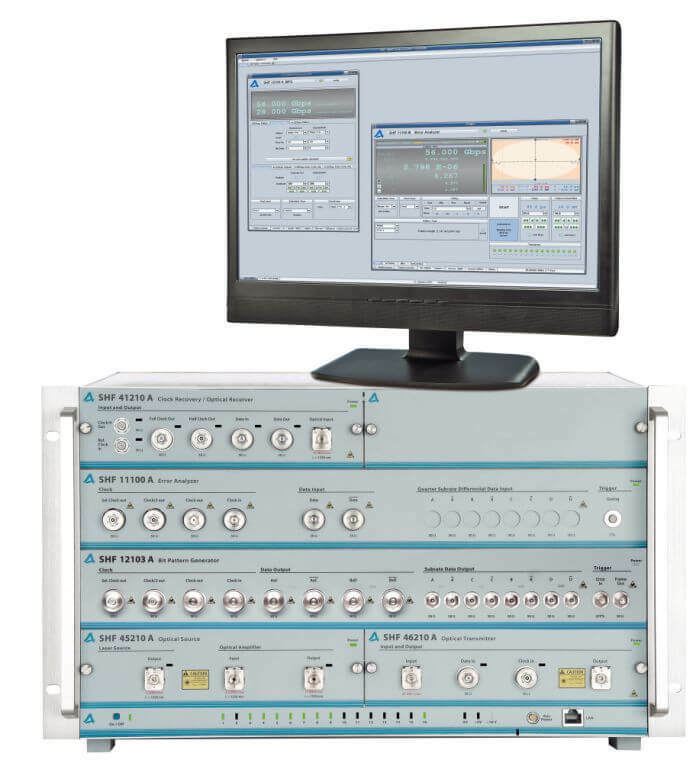 Optical receivers for ASK and DPSK signaling formats are available in both plug-in and stand-alone bench top styles. For applications where speed, signal quality and flexibility are the key factors, SHF’s plug-in modules to be hosted by a mainframe are the right choice. The mainframe is controlled over an Ethernet connection by an external computer. SHF’s compact bench-top series provide a high performance signal generation solution to the cost-sensitive industry. The minimal power consumption and the light weight make it perfectly suited e.g. for on-wafer tests.